Helllo Glasgow - I am a Glasgow girl now living in New Zealand. 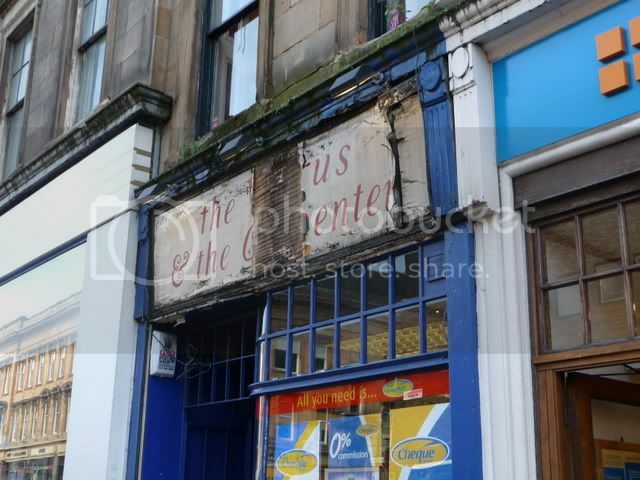 I recently had a flash back to when I was a wee girl (almost 30 years ago) and I have this vague memory of a toy shop in Glasgow (Sauchiehall St) called The Walrus & The Carpenter. It has since been on my mind almost every day and after doing a wee Google search it brought me to this website. Now that I am all joined up and figuring my way around I thought I would ask if there is anyone that can remember this toy shop? Can you remember where it was on Sauch. St? What did it look like outside/inside? Did it sell high end toys or was it cheap junk? Did it have a smell you remember etc etc. I hope to hear from someone soon . High end wooden toys as far as I remember, as well the more educational stuff. It was the only toyshop I remember that had actual puppets for sale, not cheap, crappy ones either .. ones that you would have seen on telly! Inside reminded me very much of the old Sentry Box toy shop just off Byres Road (I don't know if that's even still there). I can't believe it was such a small shop. I remember it being bigger! Wonder if it was because I was only seven or eight when I was last there. This photo has just shattered my magical childhood memories (just kidding). I am so pleased to hear that their are 'others' that loved this shop. It was a little expensive for my parents but at least I got to visit every now and then and sense the magic of this shop. More info is appreciated! I met Looie recently in Sydney, Australia and the Walrus and the Carpenter discussion started there and Looie very cleverly has brought it to this discussion forum. We started having the conversation because I have opened a toy shop in Melbourne and named it The Walrus and the Carpenter. I named it after the shop in Sauchiehall Street which I have very fond memories of. I wasn't taken there often, it was or felt high end but when I was I always remember it feeling like a huge treat. Does anyone remember the large stuffed Walrus (soft toy) in the window? I also remember that you got real puppets there with strings, my sister and I had one each and played a lot with them. Thanks for the reminder about the Paddington bears, I'd forgotten that. Anyway I would love to hear more about memories of the Walrus and the Carpenter. I still have a little post box bank someone bought for me from this shop back in 1981. I had a great-aunt who adored this shop and spent a lot of time there. She regularly brought me wee nick-nacks from it. There were wee houses that you had to put together yourself; they had wooden gable ends, the sides and roof were cardboard. You had to slot and glue them together; we had a street going at one point! I also got a wee block of modelling clay called "Daz.... something", which was a cross between plasticine and proper clay. That gave my Sindy doll a full fruit bowl! It was a fabulous shop, really magical to me when I went there, I have many happy memories of it. I'm sitting in Melbourne and yet have just walked up and down Sauchiehall street using google map UK and the new street level feature. Using the photograph posted earlier in this discussion, I found the site of The Walrus and the Carpenter in between Biggars music and Greggs the baker, it's 277. I would love to find out who owned the Walrus and the Carpenter, get more photo's and hear about your memories. The now owner of Biggars music remembered it from her childhood, especially the Paddington Bears. I remember the russian dolls the Walrus and the Carpenter sold, those that stack within each other, I've always coveted those but never got any, it's lovely that Donald abroad has named his toy shop after this magical shop, keeping the memory alive, I really think that if toys ever came to life then this wouldv'e been the place for it to happen! Who did own it? It's memory is up there along with watching Catweazle on Sundays @ my grannys! that event brings back taste, sounds and emotion, it seems the toy shop memories evoke a lot of emotions and longing for times past. Innocence perhaps! The amazing thing about Donald Abroad (she is a very funny woman) and myself is that we have gone on in life to make toys our lives and trying to make a living from it. Donald now has this amazing toys shop called The Walrus and The Carpenter and I import high end toys from Europe to New Zealand (www.plushtoys.co.nz). Just a huge thank you to all those that have given me a better insight to a wee shop in Glasgow that has played a significant role in my life. My own seven children have some of the coolest toys around! i have a rusting old badge kicking around somewhere with the logo from the shop. my memories of the shop are all similar to the rest of comments, but to your right as you entered the shop, there was the big organola? bells + drums that played when you put a shilling in (the 5p's at the time would also work) sounds a bit creepy, but old time fun. I'm from Ayrshire originally and don't remember The Walrus and the The Carpenter. When I was wee we would get to go to the Ugly Duckling toy shop in Ayr, usually twice a year - to spend Christmas and birthday money. I've got a wee boy now, and I try to explain to him that toy shops should be magical, wonderful places - not like that horrible, loathesome, hideous Toys'R'us. Yeuch! That place just makes me angry! Marcia wrote: I'm from Ayrshire originally and don't remember The Walrus and the The Carpenter. When I was wee we would get to go to the Ugly Duckling toy shop in Ayr, usually twice a year - to spend Christmas and birthday money. I've got a wee boy now, and I try to explain to him that toy shops should be magical, wonderful places - not like that horrible, loathesome, hideous Toys'R'us. Yeuch! That place just makes me angry!